How To Play Faster – Without Having To Practice! Many shredders use .08 gauge string sets. So light you’ll hardly know they’re there. 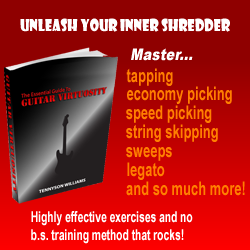 The lower your guitar’s action, the easier it is to fret the notes. Just make sure your guitar is set up properly first to avoid buzzing. This will lower the tension of your strings, making them easier to fret. A product such as Fast Fret will keep your strings slick and clean. You’ll find your digits will glide over them with ease. A scalloped fingerboard has the wood scooped out between the frets. All you have to do is lightly tough the string to fret the note, making it very fast – just ask Yngwie Malmsteen! If the back of your guitar neck is covered in sweat and filth, it will slow you down. Give it a good wipe before you play. This process grinds down your frets until the guitar feels almost fretless. It’s not great for strings bending, but it will make the neck feel much faster. Glossy guitar necks may look lovely, but after a while they get very sticky and that will seriously slow you down. Instead, take a leaf out of Zakk Wylde’s book and grab some naked wood.